Last year saw Mimmos become the biggest local donor to Food4Africa. The innovative campaign that achived this was put together with Jeremy Mansfield on the RAW show of Highveld Stereo and Claire from Mimmos. We at Food4Africa recognise the great work done in 2009 by everybody involved including the patrons of Mimmos who supported the campaign to make it the success it was. To Jeremy and his team on the RAW show, the staff and management at all the Mimmos branches, to Claire and her Mimmos marketing team and to the Mimmos patrons who enjoyed eating Jeremy’s pizza creation, we at Food4Africa say a big THANK YOU. Please know that you did make a difference to the lives of the 1800 children that benefited from the campaign. This year the challenge is even bigger – we aim to make a difference to the lives of 3000 children! 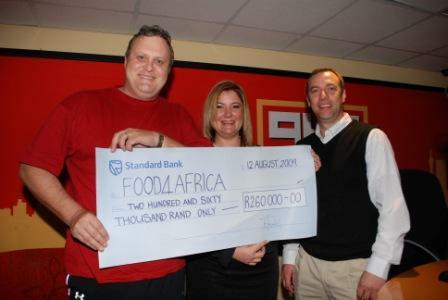 To everyone involved, please know that the Food4Africa team are humbled indeed that you and your patrons chose us and have once again given us the oppotunity to make a difference in 2010.